For other Armenian quarters, see List of Armenian ethnic enclaves. Map of the Armenian Quarter, without the area considered by Israel as part of the Jewish Quarter (centre right). The monastery (Patriarchate) compound is shown in grey. The Cathedral of St. James is shown in darker grey. The Armenian Quarter (Arabic: حارة الأرمن‎, Harat al-Arman; Hebrew: הרובע הארמני, Ha-Rova ha-Armeni; Armenian: Հայոց թաղ, Hayots t'agh)[a] is one of the four quarters of the walled Old City of Jerusalem. Located in the southwestern corner of the Old City, it can be accessed through the Zion Gate and Jaffa Gate. It occupies an area of 0.126 km² (126 dunam), which is 14% of the Old City's total. In 2007, it had a population of 2,424 (6.55% of Old City's total). In both criteria, it is comparable to the Jewish Quarter. The Armenian Quarter is separated from the Christian Quarter by David Street (Suq el-Bazaar) and from the Jewish Quarter by Habad Street (Suq el-Husur). The Armenian presence in Jerusalem dates back to the 4th century AD, when Armenia adopted Christianity as a national religion and Armenian monks settled in Jerusalem. Hence, it is considered the oldest living diaspora community outside the Armenian homeland. Gradually, the quarter developed around the St. James Monastery—which dominates the quarter—and took its modern shape by the 19th century. The monastery houses the Armenian Apostolic Church's Jerusalem Patriarchate, which was established as a diocese in the 7th century AD. The patriarchate is the de facto administrator of the quarter and acts as a "mini-welfare state" for the Armenian residents. The Armenian community has been in decline since the mid-20th century, and is in immediate danger of disappearing, according to Bert Vaux. The Armenian Quarter is located in the southwestern corner of Jerusalem's Old City. The quarter can be accessed through the Zion Gate and Jaffa Gate. According to a 2007 study published by the International Peace and Cooperation Center, the quarter occupies an area of 0.126 km² (126 dunam), which is 14% of the Old City's total. The Armenian Quarter is formally separated from the Christian Quarter by David Street (Suq el-Bazaar) and by Habad Street (Suq el-Husur) from the Jewish Quarter. In the early 4th century[c] Armenia, under king Tiridates III, became the first country to adopt Christianity as a state religion. A large number of Armenian monks are recorded to have settled in Jerusalem as early as the 4th century, after the uncovering of Christian holy places in the city. However, the first written records are from the 5th century. Jerusalem is thus considered the oldest living diaspora community outside the Armenian homeland. Philip Marsden wrote that the survival of Armenians in Jerusalem–"most intense of all cities"—proves their extraordinary resilience. Armenian churches were constructed during that period, including the St. James Monastery. The latter was last expanded in the mid-12th century. An Armenian scriptorium was in operation by the mid-5th century. A secular community composed of merchants and artisans was established in the 6th century in the Zion Quarter, where an Armenian street existed (Ruda Armeniorum). In the First Council of Dvin (506), the Armenian Church broke off from the rest of Christianity by rejecting the dual nature of Christ, which was agreed upon in the Council of Chalcedon of 451. Thus, the Armenians found themselves in direct confrontation with the Byzantine Empire. Emperor Justinian I persecuted the Monophysite Armenians, forcing them to leave Jerusalem. A 7th-century Armenian chronicler mentioned the existence of seventy Armenian monasteries in Palestine, some of which have been revealed in excavations. The Byzantines ceded Jerusalem to the Rashidun Caliphate after a siege in 637. Until this point, Jerusalem had a single Christian bishop. In 638 AD, Armenians established their own archbishop, Abraham I. He was officially recognized by Rashidun Caliph Umar. The foundation of the Armenian migration to Jerusalem thus solidified. In the 12th century, around one thousand Armenians moved to Jerusalem with the Crusaders, presumably mainly from the Armenian Kingdom of Cilicia. The order of our master Sultan Jaqmaq [has been issued] which stipulates that the taxes levied [ahdaiha] recently by the town governor (?) regarding the payment by the Armenian enclosure [dayr alarmani] be cancelled, ... and it has been requested that this cancellation be recorded in the Honored Books in the year 854 of the Hijra (1451 C.E.). Anyone who renews the payment or again takes any tax of extortion is damned, son of the damned, and the curse of Allah will be upon him. Jerusalemite historian Mujir al-Din provided a detailed description of pre-Ottoman Jerusalem in 1495 in which he mentioned Dir el-Arman (Monastery of the Armenians) or Kanisat Mar Ya'qub (St. James Cathedral). During Ottoman rule, Jerusalem developed into a cosmopolitan city. There was religious tolerance and an Ottoman administration existed to sort out religious differences between the rival Christian churches and Muslims. Israeli historians Kark and Oren-Nordheim wrote in 2001: "The Armenian Quarter, although Christian, represented a distinct ethnic group with its particular language and culture, intent on retaining separate identity and unity, minimizing the contacts with Arabs and the Ottoman authorities for fear of persecution." However, the Armenian community in Jerusalem was Arabic-speaking (in addition to Armenian or European languages) and self-identified with Palestinian society. In 1538, the current walls of Jerusalem were completed on the orders of Sultan Suleiman the Magnificent. These walls, along with the internal walls built by the Armenians, determined the outline of the quarter. In the 1562–63 record, only 189 Armenians were counted, whereas 640 were counted by the Ottomans in 1690, an increase of 239%. According to the chronicler Simeon Lehatsi only some twelve Armenian families lived in Jerusalem in 1615–16. The significant increase in the population in 1690 is attributed to urbanization experienced by the Armenians and other Christians. Thus Armenians came to make up 22.9% of Jerusalem's Christians by 1690, becoming the second largest Christian community. In the 19th century, most of the Armenian and Christian quarters had "European-style gable roofs" as opposed to the domes preferred in the Muslim and Jewish quarters. In 1833 the Armenians established the city's first printing press. A seminary was opened in 1857. In 1855 the first photographic workshop in Jerusalem was founded in the Armenian Quarter. Schools for boys (1840) and girls (1862) were united in 1869 under the name Holy Translators' School and became the first coeducational school in Jerusalem. In 1854 Karl Marx reported 350 Armenians in Jerusalem. In 1883, 102 Armenian families (8%) constituted the third largest Christian community in the Old City after the Greek Orthodox and Catholic (Latin) communities. Besides these residents, in the same year, 46 Armenian priests and monks and 55 servicemen lived within the St. James Monastery. According to the 1905 Ottoman census in the Old City, the Armenian Quarter had a population of 382, of which Armenians (121) comprised less than one-third (31.7%). Jews (127) made up 33.2%, other Christians (94) 24.6% and Muslims (40) 10.5%. The Jews, who numbered a little more than the Armenians, inhabited the eastern part of the Armenian Quarter, which in the second half of the nineteenth century, became the western part of the Jewish Quarter. Prior to World War I, there were some 2,000–3,000 Armenians in Palestine, mostly in Jerusalem, which was captured by the British in 1917. From 1915 and onward, thousands of Armenian Genocide survivors from Cilicia (Adana Vilayet) found refuge, and settled in the quarter, increasing its population. In 1925, around 15,000 Armenians are believed to have lived in all of Palestine, with the majority in Jerusalem. During the British Mandate period, the number of Armenians is estimated to have reached up to 20,000. However, the 1931 British census showed only 3,524 Armenians in all of Palestine. In 1947, around 1,500 Armenians from Palestine repatriated to Soviet Armenia as part of the Soviet government's efforts to boost Armenia's population by a large-scale repatriation of ethnic Armenians, mostly from the Middle East. This marked the beginning of the long-term decline of the Armenian community of Jerusalem. During the 1948 Arab–Israeli War, the Armenian Quarter was damaged by bombs. It housed many Armenians from around Palestine. An Armenian civil guard, armed with what Der Matossian describes as "makeshift weapons", was formed to defend the quarter. Over 40 Armenians died during the war. Jerusalem's Old City came under Israeli control in the aftermath of the Six-Day War in 1967. However, the Armenian patriarchate is the de facto administrator of the quarter and acts as a "mini-welfare state" for the Armenian residents. The Arab-Israeli conflict significantly impacted the quarter's politically uninvolved Armenian population. A 1992 article published by the Catholic Near East Welfare Association stated that "Armenians in Jerusalem try to maintain good relations with Arabs and Israelis, but they do not deny that their community has been affected by tensions in the city." A major obstacle for the Armenians residing in the Armenian Quarter is their Jordanian citizenship (from before 1967), because of which the Israeli government considers them "permanent residents"—the same status as Palestinians. The Jerusalem Post wrote in 2005 that the Israeli bureaucracy "considers Jerusalem Armenians to be Palestinians, which means endless delays in getting documents, and hassles at the airport." A map published by the United Nations Office for the Coordination of Humanitarian Affairs (OCHA) in November 2015 indicated the Armenian Quarter in the color reserved for Palestinian communities. According to Armenian researcher Tamar Boyadjian, because Armenians are considered Palestinians for all legal purposes they have difficulty obtaining travel and marriage documents. Graham Usher, a Palestine-based foreign correspondent of several Western newspapers, wrote in 2000 in a publication of the Beirut-based Institute for Palestine Studies that the Armenians "were burdened with the status of being Palestinian 'residents' but ethnically Armenian. And indeed their lives, properties and heritage have been bound by the same Israeli constraints as their Palestinian compatriots." The Economist also wrote in 2000 that Armenians have faced restrictions on their lives similar to those imposed on the Palestinians, such as prevention of construction of new buildings in the Armenian Quarter. The limited space in the overpopulated district makes housing expensive and according to Boyadjian, "Most Armenians, given their current income, simply cannot afford to maintain their primary residence there." Map of the southern part of the Old City showing the four quarters and the area within the Armenian Quarter expropriated (in dark blue) for the reconstruction of an extended Jewish Quarter in 1968 (according to the Palestinian Academic Society for the Study of International Affairs). During the Jordanian rule of the eastern Jerusalem (1948–67), no Jews were allowed to live in the Old City. Since the start of Israeli rule of the Old City in 1967, the Jewish Quarter has expanded by some 40% and by 2000, 71 (12%) or 81 (14%) of the 581 properties in the Armenian Quarter were owned by Jews. The Armenian community is concerned that the Jewish Quarter "will expand as the number of Jews in the Old City continues to grow while the Armenian population withers." The location of the Armenian Quarter athwart the main access roads between the Israeli-controlled West Jerusalem and the holy sites within the Jewish Quarter and the Western Wall has made Armenian properties a prime real estate in Israeli eyes. According to Reuters, the Armenian Patriarchate "share[s] a view held by the mostly Muslim Palestinians—that Israel's designation of the whole city as capital of the Jewish state means its control of residence and building permits is being used to press Arabs and other non-Jews to give up and leave." Israeli sovereignty over the Armenian Quarter would be, according to Usher, the "worst future imaginable" for the Armenian community. Members of Jerusalem's Armenian community have voiced concerns about the Israeli government's policies and commitment to preserving their community's presence in the Old City. Writing in 2000, Graham Usher estimated that the Armenian Quarter had a population of 1,200. According to a 2007 study, the quarter housed 2,424 people (6.55% of Old City's total). Armenians began emigrating from Jerusalem's Old City in the mid-20th century, being in the middle of the conflict between Arabs and Jews, mainly since the 1948 Arab–Israeli War, and what Daphne Tsimhoni characterized as "their feeling of loneliness." The lack of a longstanding political solution to the Israeli–Palestinian conflict for Jerusalem has been cited as the main cause of the decrease in the number of Armenians in the Old City, which fell by almost half from 1,598 in 1967 to 790 in 2006. Meanwhile, the Muslim population increased from 16,681 to 27,500 and the Jewish population from 0 (after their expulsion under Jordanian occupation) to 3,089. The exodus of the Armenians intestified following the breakout of the First Intifada in 1987. 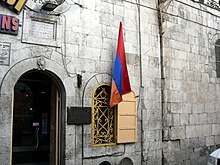 According to Tsolag Momjian, the honorary Armenian consul in Jerusalem, as of 2009 around 600 Armenians lived in the Armenian Quarter (out of the total 2,000 Armenians in all of Jerusalem). Two articles, published in 2010 and 2011, put the number of Armenians in the Armenian Quarter as low as 500. The survival of the community is today in peril. The population is dwindling. ... If the Old City were divided up today, the Armenians might barely command one street. They certainly would not lay claim to an entire Quarter, as they have for centuries. Haytayan identifies three groups of Armenians living within the Armenian Quarter The first group includes monks and clergymen (around 50), who live within the monastery. Lay people are divided into two groups: those living within the monastery compound, and those living in the Armenian Quarter, but outside of the monastery walls. Around two-thirds of lay persons reside within the monastery walls. Locally known as vanketsi (վանքեցի, lit. "those from the convent"), they number up to 700 people. They do not pay rent (or pay only a symbolic amount) to the patriarchate. Those living outside of the monastery walls are called kaghakatsi (քաղաքացի, lit. "city-dwellers"). Their ancestry goes back centuries. They only pay municipal taxes. k‘ałak‘ac‘is ("citizens" or "city dwellers") are the indigenous Armenian-speaking inhabitants of the quarter. They live outside the monastery walls, and attend the Church of the Holy Archangels (Hreshtakapetats). k‘ałt‘agans ("[im]migrants") are ancestors of Armenians from various parts of the Ottoman Empire who moved to Jerusalem following the 1915 genocide. They attend services at the cathedral of St. James. According to Vaux, "In the period immediately after their arrival they were referred to by the k‘ałak‘ac‘is as zuwar, the Arabic word for ‘visitors’. The k‘ałt‘agans in turn are reported to have labelled the k‘ałak‘ac‘is as p‘is arab ‘dirty Arab’. The two groups each remained wary of the other for some time, and in fact did not intermarry on a significant scale until after World War II. Relations subsequently improved." The Armenian dialect spoken in Jerusalem is highly distinctive, because it was geographically relatively isolated from the rest of the Armenian-speaking world, and Arabic has a significant influence on it. Those Armenians whose ancestors came from Turkey following the 1915 genocide speak Turkish-influenced Western Armenian. A detailed map of the monastery compound. Cathedral of St. James (Սուրբ Յակոբեանց վանք, Surb Hakobeants vank) is thought to have been founded in the 4th century, but the current structure dates to the 12th century. St. Toros Church (Սուրբ Թորոս եկեղեցի, Surb T'oros yekeğetsi). According to local tradition, the church was built between 1270 and 1289 by Hethum I, the Armenian King of Cilicia in memory of his son, Toros, who was killed in a battle. The church was renovated to its current state in 1727. Church of the Holy Archangels (Սրբոց Հրեշտակապետաց եկեղեցի, Srbots Hreštakapetats yekeğetsi; Deir Al Zeitoun) was founded in the 12th century probably on the ruins of an ancient church in the 4th century. The Alex and Marie Manoogian Seminary (Ալեքս եւ Մարի Մանուկեան Ժառանգաւորաց Վարժարան) was founded in 1975 through financing of Armenian-American businessman and philanthropist Alex Manoogian. Sts. Holy Translators' School (Սրբոց թարգմանչաց վարժարան, Srbots t'argmančats varžaran) contains a kindergarten, elementary and secondary schools with a total of around 150 students (as of 2000). The St. James Press (տպարան Սրբոց Յակոբեանց, tparan Srbots Hakobeants) was founded in 1833. Helen and Edward Mardigian Museum of Armenian Art and Culture was opened in 1969. Its exhibits consist of historical and religious artifacts, such as rugs, coins, copper cauldrons, ceramic tiles, a map, a replica of Johannes Gutenberg's printing press, etc. Calouste Gulbenkian Library (Կիւլպէնկեան Մատենադարան), founded in 1925 through financing of British-Armenian businessman and philanthropist Calouste Gulbenkian, for whom it is named. Officially opened on 23 October 1932, it is considered "one of the world's most comprehensive Armenian intellectual resource centers" with its 100,000 book collection. On its opening day, it contained 25,037 volumes (14,518 in Armenian and 11,519 in other languages). Three decades later, in 1963, the number reached around 50,000. St. Toros Manuscript Library, founded in 1897, holds 3,890 inventoried and cataloged Armenian manuscripts, making it the second largest in the world, after the Matenadaran in Yerevan, Armenia. In 1931, the number of cataloged manuscripts stood at 2,720. The Syriac Orthodox St. Mark's Monastery is located on Ararat St. The Assyrians/Syriacs share the Armenians's miaphysitism and "hence tended to prefer to live under the 'umbrella' of the larger and stronger Armenian community." The international community, namely the United Nations General Assembly, considers East Jerusalem of which the Old City is part, to be "Occupied Palestinian Territory". The "quiet political consensus" among the Armenians of Jerusalem, according to The Economist, is that the Old City should be "neither Palestinian nor Israeli but rather an international 'space', governed by representatives of the three faiths ... and protected by the United Nations and other international bodies." According to Graham Usher, many Armenians cautiously identify with the Palestinian struggle, but few of them "would advocate exclusive Palestinian sovereignty over the Old City." Aram I, the head of the Holy See of Cilicia, one of the sees of the Armenian Apostolic Church, based in Lebanon stated in a 2017 meeting with Lebanese President Michel Aoun that Jerusalem should be an "open city for the three monotheistic religions: Jewish, Christian, and Muslim, and that the religious rights of these peoples should be protected within Jerusalem." Furthermore, Armenians consider the Armenian Quarter to be part of the Christian Quarter. This stance was reaffirmed by Armenia's Foreign Minister Vartan Oskanian, who in late 2000 stated that Armenia was against the separation of the Armenian and Christian Quarters. In 2017 Foreign Minister Eduard Nalbandyan stated that "Jerusalem has a centuries old Armenian presence, a rich Armenian historical and cultural heritage. Armenian Apostolic Church is one of the major guardians of the Christian Holy Places. Therefore, we attentively follow all developments with regard to Jerusalem." At the 2000 Camp David Summit, U.S. President Bill Clinton proposed the division of the Old City, according to which the Armenian Quarter would be put under de jure Israeli sovereignty along with the Jewish Quarter, while the Palestinians would be granted a "certain degree of sovereignty" over the Christian and Muslim Quarters. Israeli Prime Minister Ehud Barak conditionally embraced the proposal. Palestinian leaders have publicly declared that they consider the Armenian Quarter to be a part of Palestine and will not relinquish it to Israel. Yasser Arafat, rejected the US proposal at the 2000 Camp David Summit for the Old City's division and stated: "The Armenian quarter belongs to us. We and Armenians are one people." He told Clinton, "My name is not Yasir Arafat, it is Yasir Arafatian," making his name sound Armenian. "I will not betray my Armenian brothers," Arafat said about leaving the Armenian Quarter under Israeli rule. Commenting on his statements, historians Barry Rubin and Judith Colp Rubin wrote that "there was no reason to believe that the Armenians preferred his control [over Israeli control]." In a 2011, meeting with leaders of various Christian communities in Ramallah Palestinian President Mahmoud Abbas stated: "The Palestinian leadership sticks to its position that considers the Armenian Quarter an integral part of east Jerusalem, the capital of the independent Palestinian state." According to the Palestine Papers, leaked by Al Jazeera in 2011, chief Palestinian negotiator Saeb Erekat proposed a geographical division of the Old City at an October 2009 meeting, according to which Israel would acquire sovereignty over the entire Jewish Quarter and "part of the Armenian Quarter." In the Armenian Quarter only one sector is actually occupied by the Armenian compound. The Armenian compound has a wall around it enclosing the big cathedral and its adjoining buildings. The rest of the quarter had to have a name. It wasn't Jewish, it wasn't Moslem, it wasn't Christian. So they applied to this section the name of its neighbor Armenian—simply a convenient fiction. From the first Christian centuries, the Armenian community in Jerusalem has had an illustrious history, marked not least by an extraordinary flourishing of monastic life and culture linked to the holy places and the liturgical traditions which developed around them. This venerable Cathedral Church, together with the Patriarchate and the various educational and cultural institutions attached to it, testifies to that long and distinguished history. ^ "Apart from their monophysite views there is no reason why the Armenian community should not live happily with the other groups in the Christian Quarter. Yet, David Street is a dividing line of more than just theological significance, for the Armenians with their separate language and culture from the Arabs also have an almost exclusively commercial economic basis. Apart from the comparatively close relations between the Syrian Orthodox Community and the Armenians for theological reasons, the Armenians have preferred to separate themselves from Arabs of all faiths." ^ The traditional date is 301 AD. A growing number of authors argue that the correct date is 314 by citing the Edict of Milan. Elizabeth Redgate writes that "the scholarly consensus is to prefer c. 314." ^ "The remaining third includes churches of four other denominations: Syriac Orthodox, Greek Orthodox, Maronite and Anglican." ^ Ormanian 1931, p. 4. ^ Hopkins 1971, p. 76. ^ a b "The Armenian Quarter". Jewish Virtual Library. ^ a b c Haytayan 2011, p. 180. ^ a b Khamaisi et al. 2009, pp. 22, 71. ^ Arnon 1992, p. 5. ^ Panossian, Razmik (2006). The Armenians: From Kings and Priests to Merchants and Commissars. New York: Columbia University Press. p. 42. ISBN 978-0-231-51133-9. ^ Redgate, A. E. (2000). The Armenians. Oxford: Blackwell Publishing. p. 314. ISBN 978-0-631-22037-4. ^ a b Hewsen 2001, p. 89. ^ a b c Grgearyan, Hakob; Hakobjanyan, Davit (1977). "Երուսաղեմ [Jerusalem]". Soviet Armenian Encyclopedia Volume 3. pp. 641–642. ^ Der Matossian 2011, p. 25. ^ a b c Vaux 2002, p. 5. ^ Marsden, Philip (2015) . The Crossing Place: A Journey Among the Armenians. William Collins. p. 7. ISBN 978-0-00-812743-5. ^ Sanjian, Avedis (1965). The Armenian Communities in Syria under Ottoman Dominion. Cambridge, MA: Harvard University Press, pp. 1–6. ^ a b c d e Hacikyan, Agop Jack; Basmajian, Gabriel; Franchuk, Edward S.; Ouzounian, Nourhan (2005). "Armenians in Jerusalem". The Heritage of Armenian Literature: From the Eighteenth Century to Modern Times. Detroit: Wayne State University Press. pp. 32–34. ISBN 978-0-8143-3221-4. ^ a b Martirosyan 2001, p. 52. ^ Manoogian 2013, p. 30. ^ Quoted in Joseph Drory, "Jerusalem During the Mamluk Period (1250–1517)," in The Jerusalem Cathedra: Studies in the History, Archaeology, Geography, and Ethnography of the Land of Israel, ed. Lee I. Levine. Jerusalem: Yad Izhak Ben-Zvi Institute, 1981, p. 212. ^ Arnon 1992, p. 8. ^ Kark, Ruth and Michal Oren Nordheim (2001). Jerusalem and Its Environs: Quarter, Neighborhoods, Villages, 1800–1948. Detroit: Wayne State University Press, p. 45. ^ Der Matossian 2011, p. 26. ^ a b Peri, Oded (2001). Christianity under Islam in Jerusalem: The Question of the Holy Sites in Early Ottoman Times (Ottoman Empire & Its Heritage). Leiden: Brill, p. 20. ^ Kark & Oren-Nordheim 2001, p. 70. ^ Naguib 2008, p. 37. ^ a b Bremer 2007, p. 273. ^ Marx, Karl (15 April 1854). "Declaration of War. – On the History of the Eastern Question". New-York Daily Tribune. ^ Arnon 1992, p. 36. ^ Arnon 1992, p. 38. ^ Arnon 1992, p. 50. ^ Arnon 1992, p. 52. ^ Der Matossian 2011, p. 29. ^ Shemassian, Vahram (2012). "Armenian Genocide Survivors in the Holy Land at the End of World War I". Journal of the Society for Armenian Studies. 21: 247–77. ^ a b c Der Matossian 2011, p. 30. ^ Der Matossian 2011, p. 31. ^ Der Matossian 2011, p. 39. ^ a b c d e "Armenians caught in the middle". The Economist. 7 September 2000. ^ "New movement restrictions in East Jerusalem" (PDF). United Nations Office for the Coordination of Humanitarian Affairs. 5 November 2015. Archived from the original (PDF) on 18 March 2016. ^ a b c d e f g h i j Usher, Graham (2000). "Fifteen Centuries and Still Counting—the Old City Armenians". Jerusalem Quarterly. Institute for Palestine Studies (9): 35–39. ^ a b c Karanian, Matthew (12 October 2010). "Armenians in Jerusalem: The Politics of Survival in the Holy Land". Asbarez. ^ Tsimhoni 1983, p. 61. ^ Khamaisi et al. 2009, p. 43. ^ Tsimhoni 1983, p. 64. ^ Vaux 2002, p. 6. ^ Vaux 2002, p. 2. ^ Vaux 2002, pp. 1–2. ^ Hewsen 2001, p. 271. ^ a b Shinar, Anat (30 April 2013). "Jerusalem Church — Over 50 Churches in the Old City". jerusalem.com. ^ Manoogian 2013, pp. 45–46. ^ "1975 Inauguration of the Alex and Marie Manoogian seminiary in Jerusalem". Armenian General Benevolent Union on Flickr. ^ "Alex and Marie Manoogian to be Interred in Holy Etchmiadzin". Armenian General Benevolent Union. 2007. ^ Manoogian 2013, p. 43. ^ Manoogian 2013, p. 48. ^ Manoogian 2013, p. 49. ^ Manoogian 2013, p. ii. ^ Manoogian 2013, pp. 54, 85. ^ Manoogian 2013, p. 3. ^ Manoogian 2013, p. 88. ^ Manoogian 2013, p. 122. ^ Manoogian 2013, p. 1. ^ a b Manoogian 2013, p. 46. ^ Coulie, Bernard (2014). "Collections and Catalogues of Armenian Manuscripts". In Calzolari, Valentina (ed.). Armenian Philology in the Modern Era: From Manuscript to Digital Text. Brill Publishers. pp. 26. ISBN 978-90-04-25994-2. ^ Manoogian 2013, p. 45. ^ Gibson, Shimon (1987). "The 1961–67 Excavations in the Armenian Garden, Jerusalem". Palestine Exploration Quarterly. 119 (2): 81–96. doi:10.1179/peq.1987.119.2.81. ^ "Armenians have long presence in Jerusalem". seetheholyland.net. ^ "St. Mark Church – Syrian Orthodox". jerusalem.com. 21 October 2012. ^ Hopkins 1971, p. 73. ^ "Maronite Church: Old City-Armenian Quarter, 25 Maronite Convent st". Jerusalem Foundation. Archived from the original on 4 March 2016. ^ Jacobs, Daniel (2009). The Rough Guide to Jerusalem. Penguin. p. 7. The Armenian Quarter includes Jerusalem's citadel, known as the Tower of David. ^ "Israeli settlements in the Occupied Palestinian Territory, including East Jerusalem, and the occupied Syrian Golan". un.org. 12 January 2012. ^ "Մեծի Տանն Կիլիկիոյ Կաթողիկոսութեան Ազգային Ընդհանուր Ժողովի Պատուիրակութիւնը Այցելեց Լիբանանի Հանրապետութեան Նախագահին". Aztag (in Armenian). 7 December 2017. ^ "Արամ Ա. Վեհափառը մերժեց Երուսաղէմը Իսրայէլի մայրաքաղաք նկատող Միացեալ Նահանգներու մօտեցումը". Aravot (in Armenian). 7 December 2017. ^ Odeh, Adnan Abu (1996). "Religious Inclusion, Political Inclusion: Jerusalem as an Undivided Capital". Catholic University Law Review. 45 (3): 692. Archived from the original on 30 January 2015. In fact, the Armenians consider their quarter to be part of the Christian Quarter. ^ "Comment by Edward Nalbandian, Foreign Minister of Armenia on the Status of Jerusalem". mfa.am. Ministry of Foreign Affairs of the Republic of Armenia. 6 December 2017. ^ a b Rubin, Barry; Colp Rubin, Judith (2005). Yasir Arafat: A Political Biography. Oxford University Press. pp. 196–197. ISBN 978-0-19-518127-2. ^ "Basic Law: Jerusalem, Capital of Israel (Unofficial translation)". knesset.gov.il. ^ "Letter of the Patriarchs of Jerusalem to Camp David Summit". Latin Patriarch of Jerusalem. 17 July 2000. Archived from the original on 27 April 2002. ^ "Visit to the Armenian Patriarchal Church of St. James: Address of His Holiness Benedict XVI". vatican.va. Holy See. 15 May 2009. Azarya, Victor (1984). The Armenian Quarter of Jerusalem. University of California Press. ISBN 978-0-520-04749-5. Bremer, Joerg (2007). "Swan Song in the Holy Land: The Armenian Quarter in Jerusalem". In v. Voss, Huberta (ed.). Portraits of Hope: Armenians in the Contemporary World. Berghahn Books. pp. 271–274. ISBN 9781845452575. Hewsen, Robert H. (2001). Armenia: A Historical Atlas. Chicago: University of Chicago Press. ISBN 978-0-226-33228-4. Kark, Ruth; Oren-Nordheim, Michal (2001). Jerusalem and Its Environs: Quarters, Neighborhoods, Villages, 1800–1948. Wayne State University Press. ISBN 978-0-8143-2909-2. Naguib, Nefissa (2008). "Armenian Memories of Relief in Jerusalem". In Naguib, Nefissa; Okkenhaug, Inger Marie (eds.). Interpreting Welfare and Relief in the Middle East. Brill Publishers. pp. 35–56. ISBN 978-9004164369. Ormanian, Malachia (1931). Հայկական Երուսաղէմ (Armenian Jerusalem) (in Armenian). Jerusalem: St. James Press. Arnon, Adar (1992). "The Quarters of Jerusalem in the Ottoman Period". Middle Eastern Studies. 28 (1992): 1–65. doi:10.1080/00263209208700889. JSTOR 4283477. Der Matossian, Bedross (2011). "The Armenians of Palestine 1918–48". Journal of Palestine Studies. 41 (1): 24–44. doi:10.1525/jps.2011.XLI.1.24. JSTOR 10.1525/jps.2011.XLI.1.24. Haytayan, Laury (2011). "Armenian Christians In Jerusalem: 1700 Years of Peaceful Presence" (PDF). Politics and Religion Journal. 5 (2): 179–195. Archived from the original (PDF) on 29 January 2015. Martirosyan, Hmayak (2001). "Международный статус Иерусалима и местная армянская община [International Status of Jerusalem and Local Armenian Community]". Patma-Banasirakan Handes (in Russian) (2): 50–57. ISSN 0135-0536. Tsimhoni, Daphne (1983). "Demographic Trends of the Christian Population in Jerusalem and the West Bank 1948–1978". Middle East Journal. 37 (1): 54–64. JSTOR 4326524. Hopkins, I. W. J (1971). "The four quarters of Jerusalem". Palestine Exploration Quarterly. 103 (2): 68–84. doi:10.1179/peq.1971.103.2.68. Manoogian, Sylva Natalie (2013). "The Calouste Gulbenkian Library, Armenian Patriarchate of Jerusalem, 1925–1990: An Historical Portrait of a Monastic and Lay Community Intellectual Resource Center" (dissertation). University of California, Los Angeles. Wikimedia Commons has media related to Armenian Quarter, Jerusalem.